Getting to the top viewpoint of a flat city is difficult. Fortunately we have plenty of towers that will provide a stellar view to the city. And you can get into them for free or a small fee. Some are easy to access others will give you absolutely free fitness on the plentiful stairs. 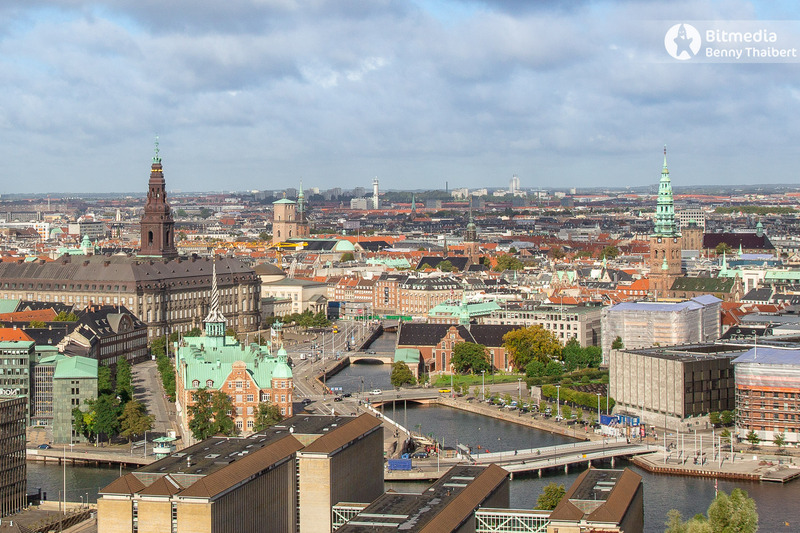 But where is the very best views actually in Copenhagen? 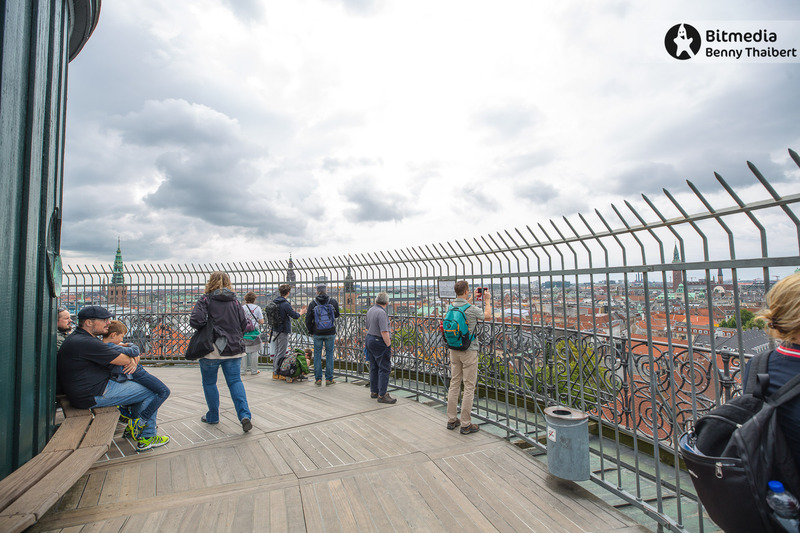 Views where you can enjoy the old skyline and the historical details on the old buildings? 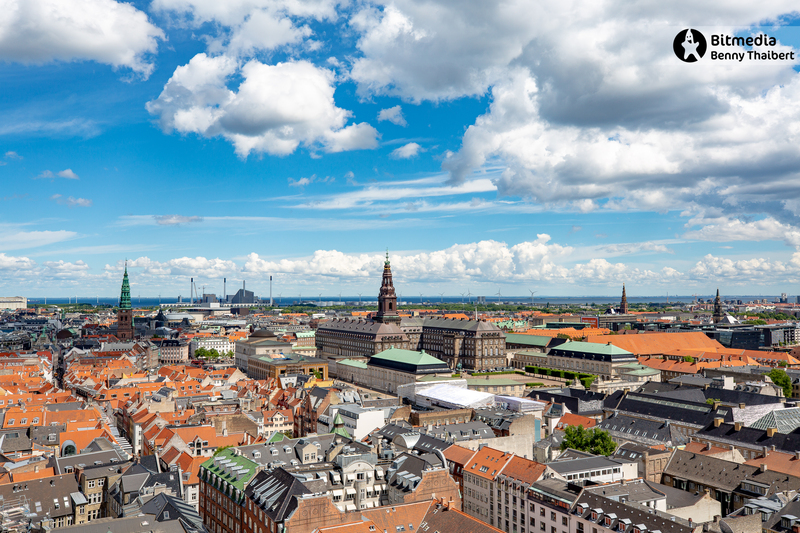 The skyline of Copenhagen is very low due to former fire regulations. But in the recent 20 years we see loads of Minecraft building block (cubes) inspired architecture popping up all over. Slowly hiding the old towers and vibrancy of the core city. So, get out there before the skyline will look a suburban shopping center! 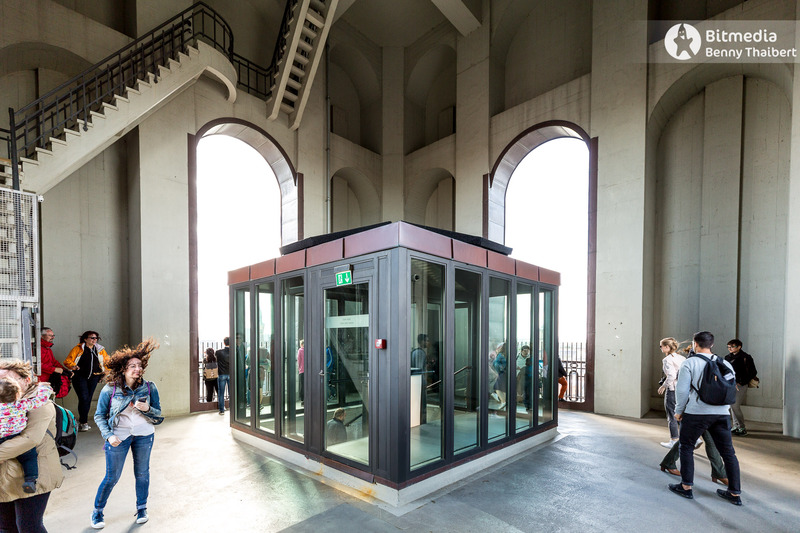 However, when you are up in a beautiful tower, you wont see that one in your panoramic view. But I would suggest you go for at least a two tower trips. Which will give you the best views towards the core of the city. The towers are quite close to each other so you can walk from A to B to C.
Blue Marker: Restricted access to certain hours, days or seasons. 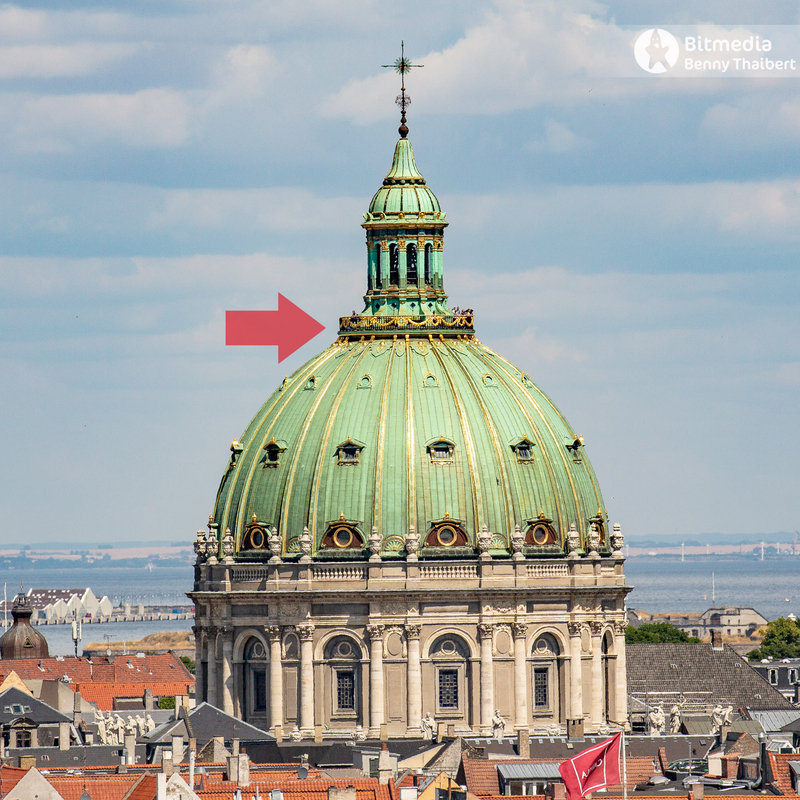 The Church of Our Saviour (Danish: Vor Frelsers Kirke) is a baroque church in Copenhagen, Denmark, most famous for its helix spire with an external winding staircase that can be climbed to the top. the helix is build counter clockwise. 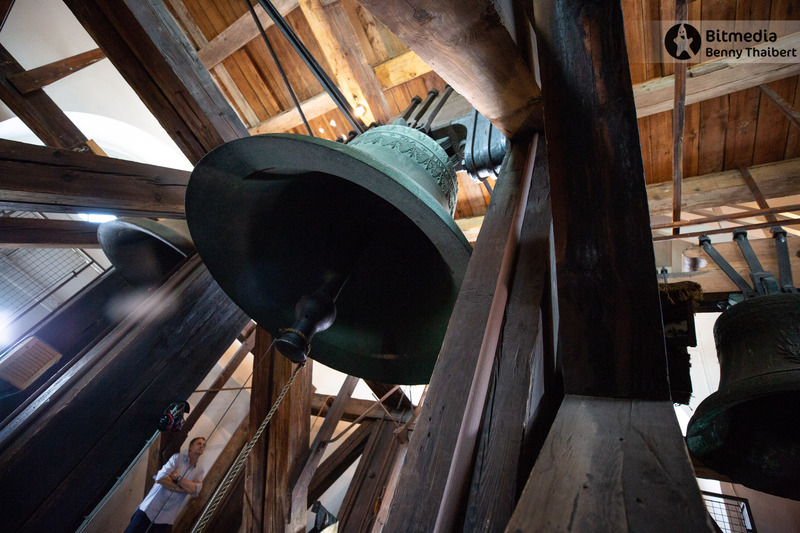 It is also noted for its carillon, which is the largest in northern Europe and plays melodies every hour from 8 am to midnight. It is a very beautiful tower where you will experience loads of stairs an an adventurous ascent. Not for the fainthearted! 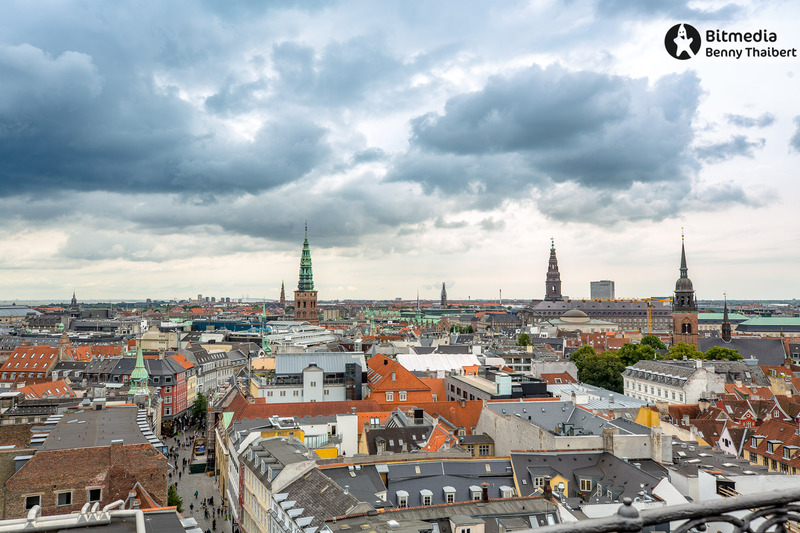 The view is very spectacular facing all the other towers and even a top view on Christiania and the all the new Minecraft inspired block buildings on Amager. Getting up: Fairly easy first part. The last part is getting narrow before you enter the helix. If you have fear of heights this might not be the adventure for you. The rail is designed in 1752 where people were not that tall. It’s a thrill! Windmills at sea and the industrial area. In Front a look into Christiania and the green area. 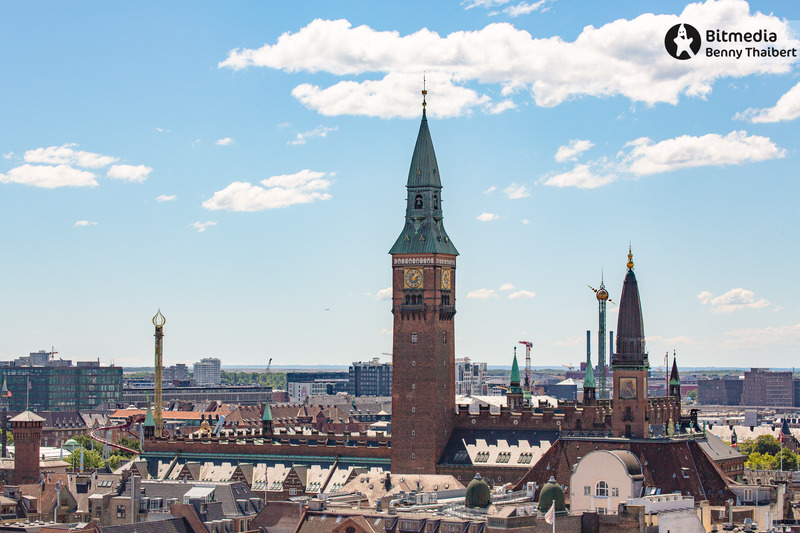 -is basically the tower on the parliament building Christiansborg Castle. The palace is home to the three supreme powers: the executive power, the legislative power, and the judicial power. It is the only building in the world that houses all three of a country’s branches of government. 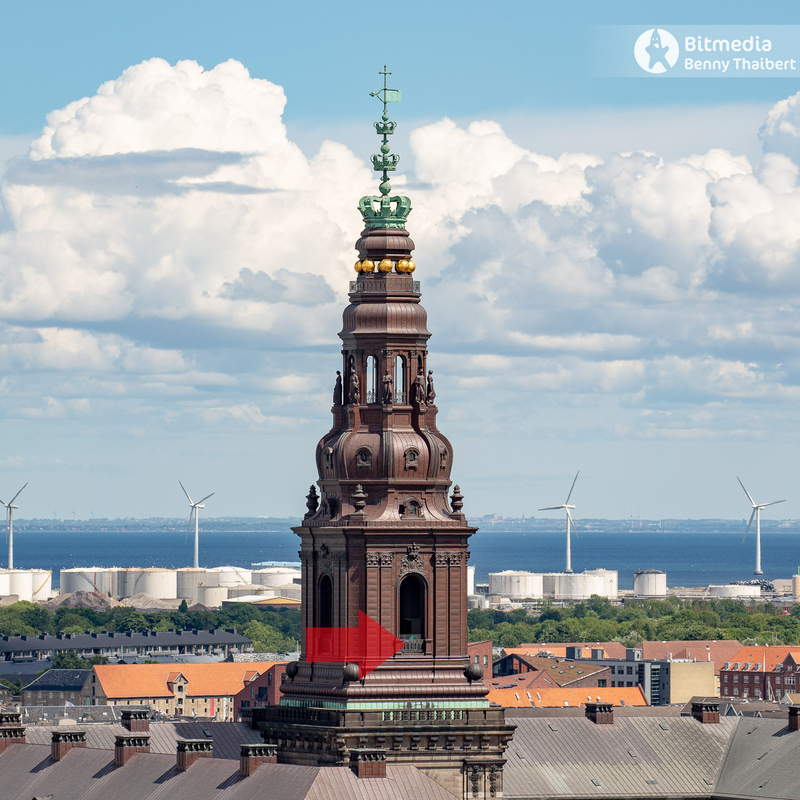 The name Christiansborg is thus also frequently used as a metonym for the Danish political system. Or “Borgen” as in the TV-series. You do not get to the very top, but the view is really good. 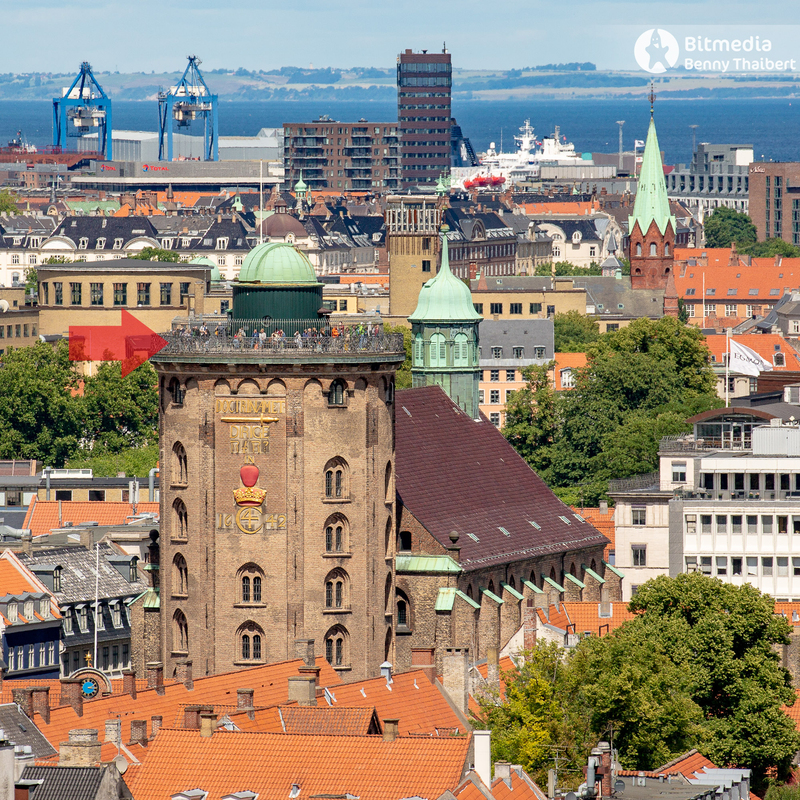 You’ll get the best view towards The church of our Saviour, The old Stock Exchange (Børsen) with the dragon tail tower. The tower has 4 super big openings where 2 of them covers the old core of the city. It is a very roomy viewpoint just as The Round Tower. But it can have a crowded que to get up there in high season. Getting up: There is a security check where your bags gets scanned. There is basically no stairs. You have the chance to go full elevator up. First will get you to a restaurant. Second to a platform hosting another elevator or stairs for the last few meters. Thus meaning there is access for wheel chairs here! Also a very good opportunity for the not so mobile elderly to get a top view. 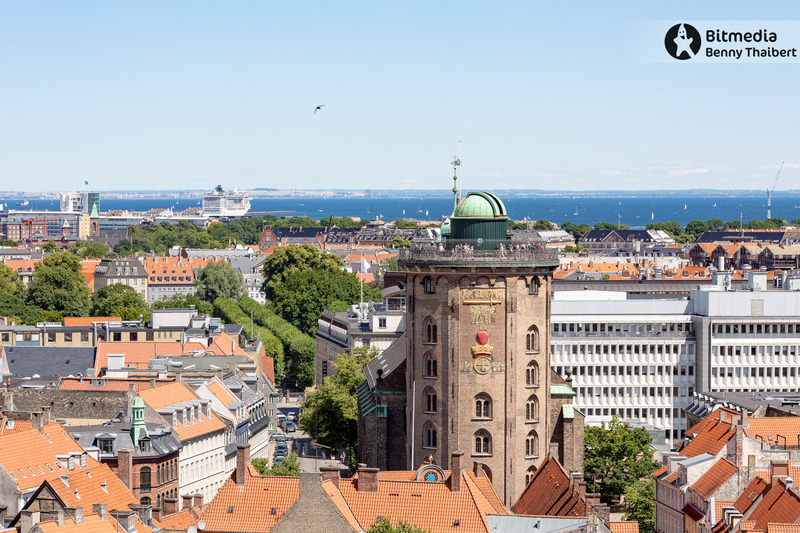 The Round Tower was built by Christian IV between 1637 and 1642. It was the first part of the Trinitatis Complex, which combined church, library and observatory in a single building. Maybe that was the reason tor the trinity name. 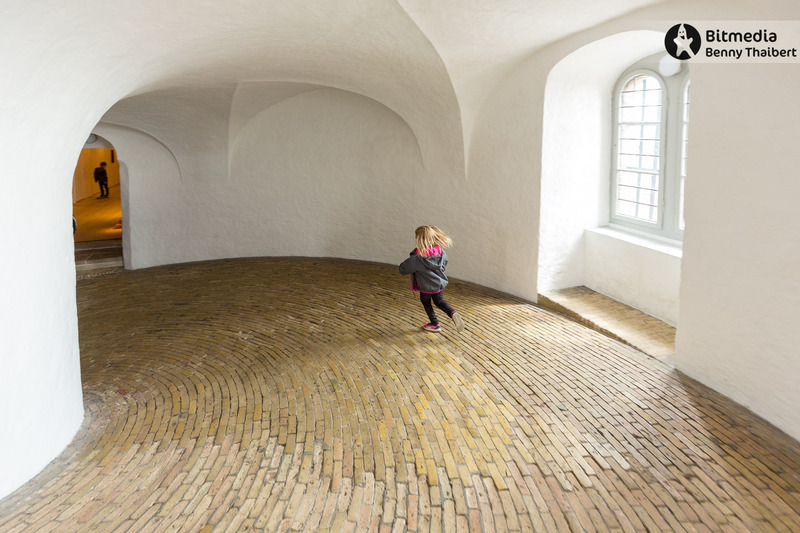 The spiral walk is 281 m long and winds itself 7,3 times round the hollow core of the tower. 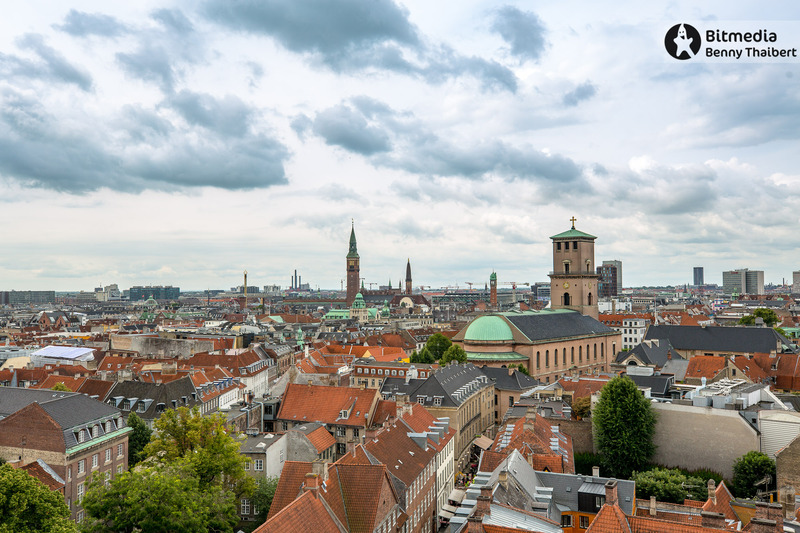 The Round Tower is Europe’s oldest functioning astronomy observatory. Used by amateur astronomers and others who wish to explore the skies. 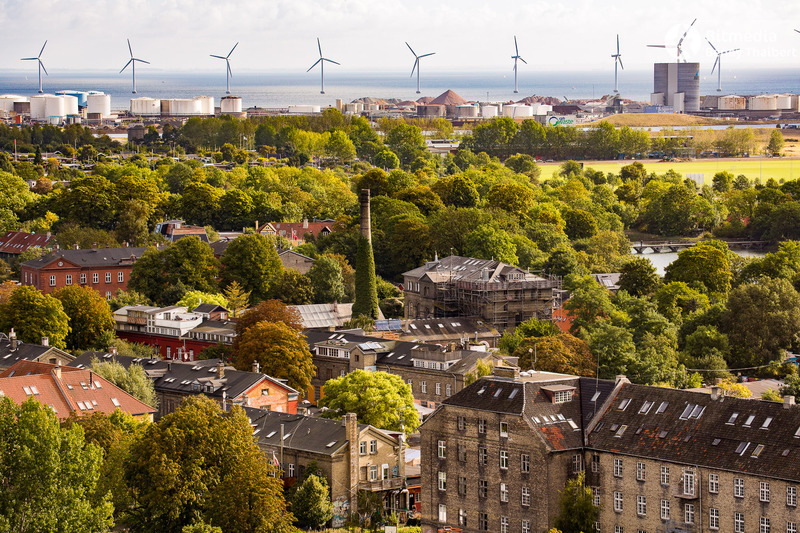 The view is literally in the middle of the city with a perfect look toward Vor Frue Kirke. The fence around the platform might be a bit spoiling but you will get fine info graphic telling which towers you see in the horizon. Getting up: You walk upwards on a spiral ramp. The last final steps are on stairs to the view platform. There is a kiosk on the top trying to sell overpriced souvenirs and ice cream. The ascent and descent is always a thrill for children! 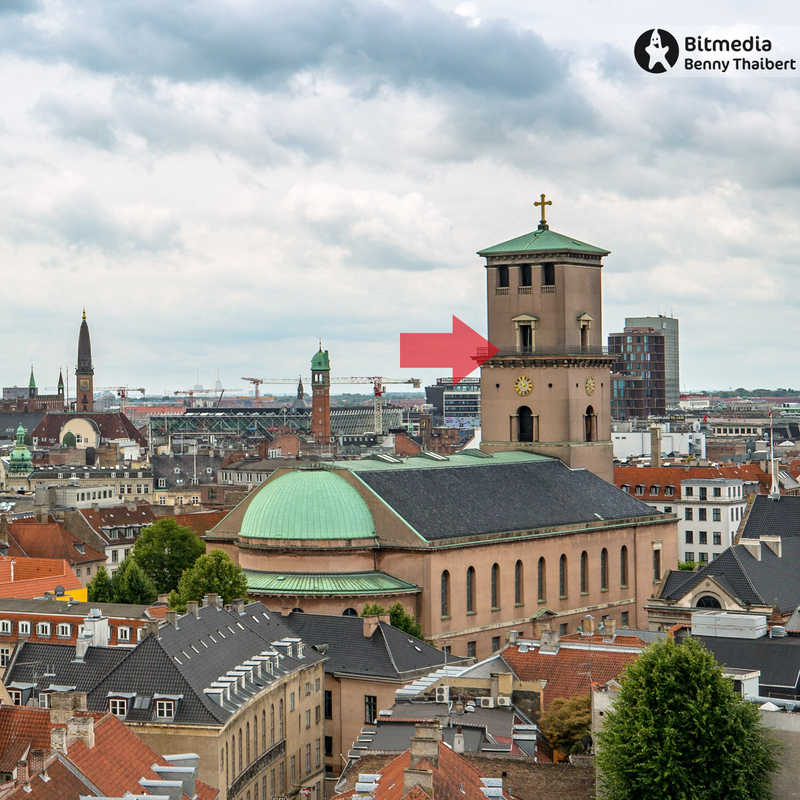 This is the 5th largest dome church in Europe. And it is a part of the line architecture around Amalienborg. The church was planned and started to become built in 1749. In 1770 the process stopped due to the next King did not want to spend money on it or he just lacked money. Later a rich guy named Tietgen, who obviously managed his wealth way better than the royal family, spent some of his wealth to finish the church and it opened 1894. The inside of the church is worth to explore. The view is mathematically perfect towards the Royal residence and the Opera. 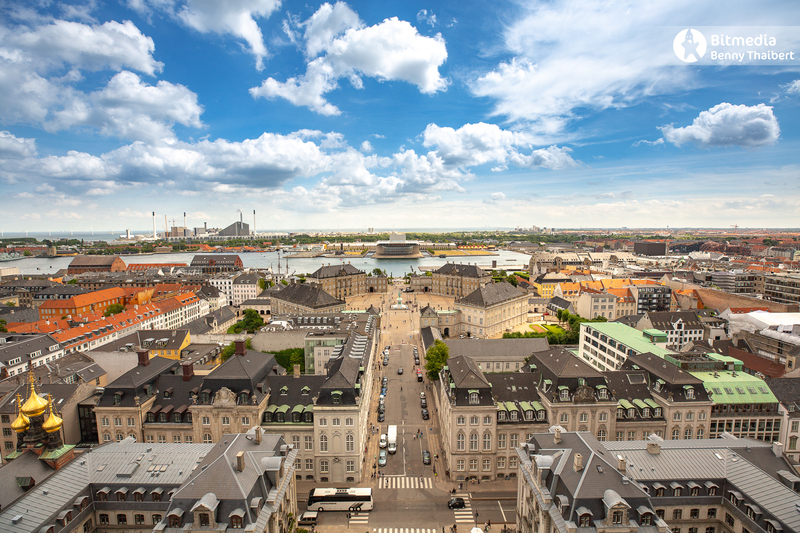 This is the very best view towards Frederiksstaden (the city area containing Amalienborg – Royal Residence). 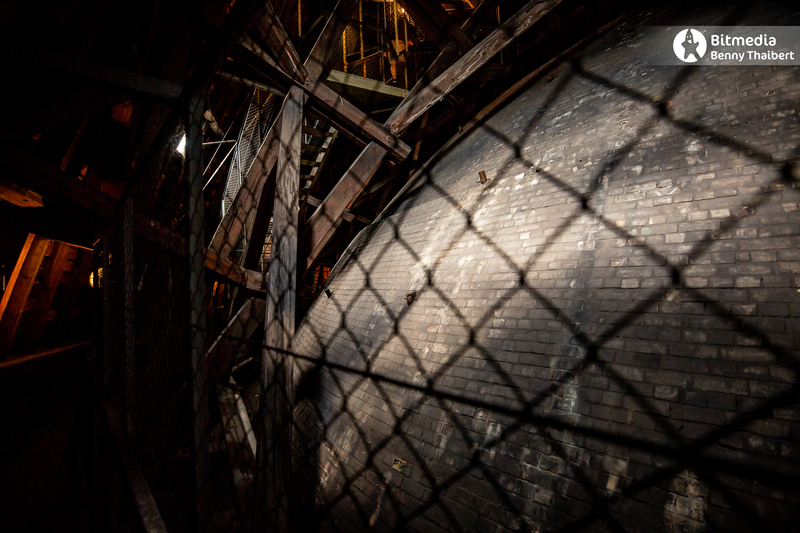 Getting up: You walk upwards in a wide staircase to a exhibition platform circling the bottom of the dome. The you take a narrow spiral staircase before entering the dome hall. The rest of the way is on modern metal stairs with a fenced rail. From here you can explore the dome from inside. It is a small run so you will not be exhausted. Construction began in 1892 and the hall was opened on September 12, 1905. 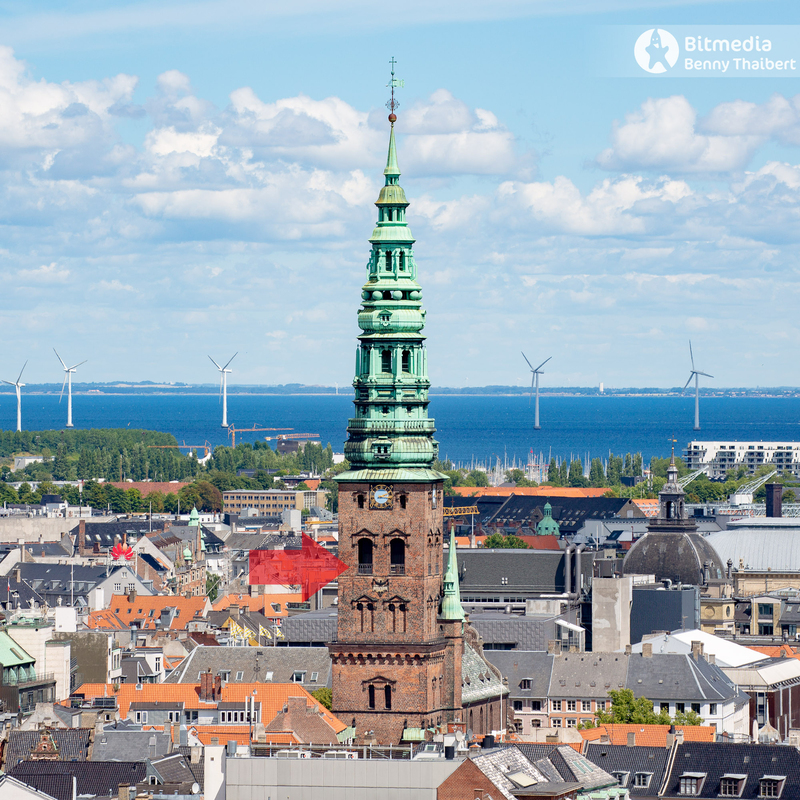 The City Hall has been used for scenes in Danish hit tv series like “The Killing” and “Borgen”. The style of the building is national romantic with a lot of decor. Take your time to explore the main hall on exit. It’s worth it. 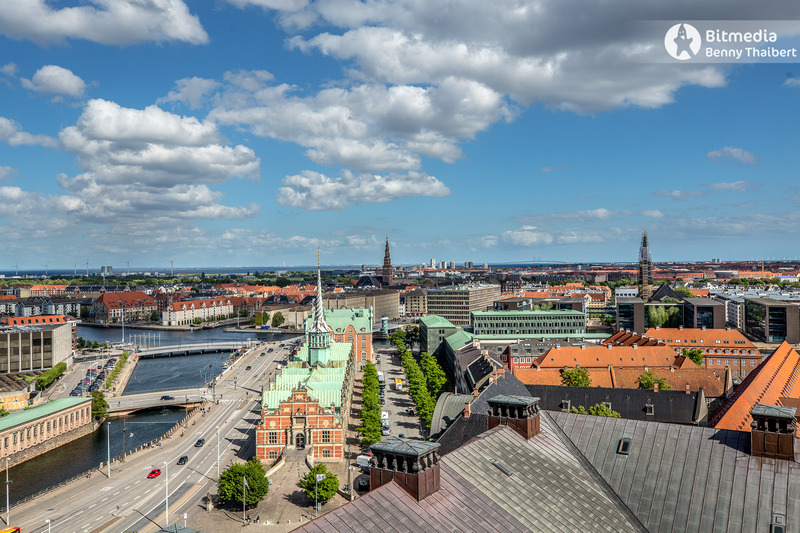 The view is perfect towards Christiansborg. The platform is big and roomy with all 4 sections open. Getting up: You walk upwards in a wide staircase to a exhibition platform.Then you get a spiral staircase followed by rather large wooden section to the top. Quite easy to access. The Church is worth a sightseeing. Especially due to the work of famous Sculptor Bertil Thorvaldsen. And the clear building style. 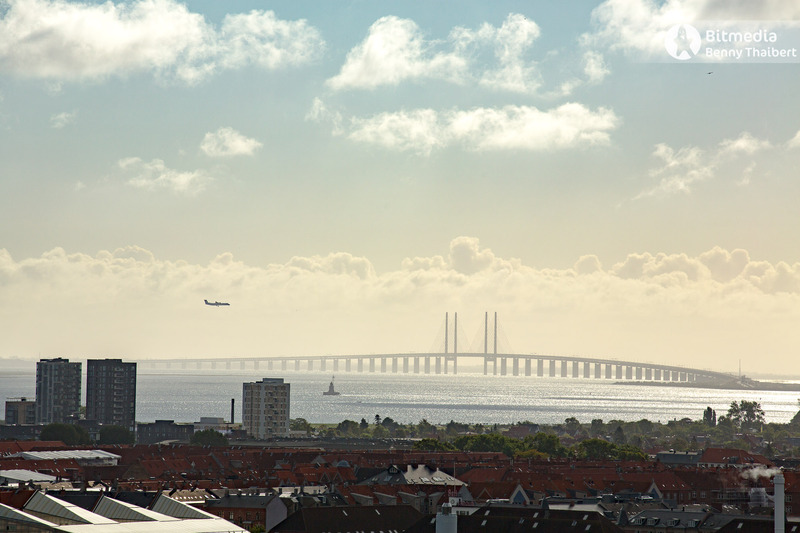 It has the best view towards Rundetårn. 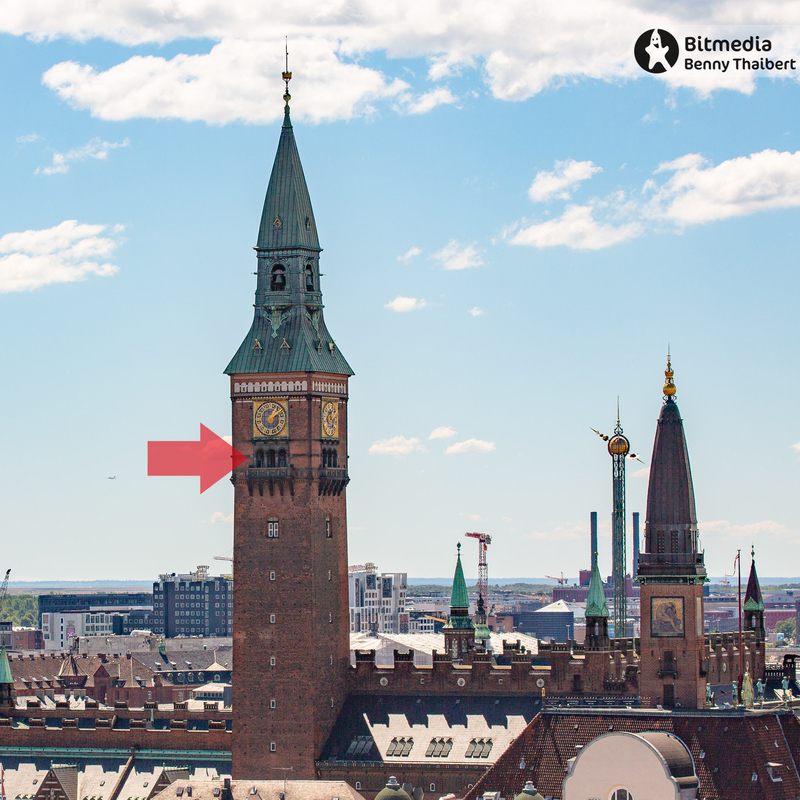 The riddle on the side of the tower is fully visible in a very nice perspective. 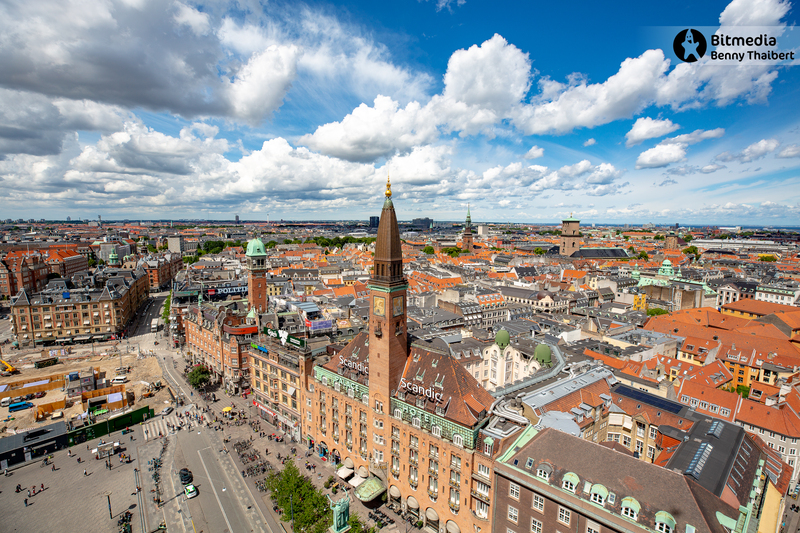 Address: Nørregade 8, 1165 København. Getting up: Spacious stairs all the way. Really easy access. On the way up you pass the bells. 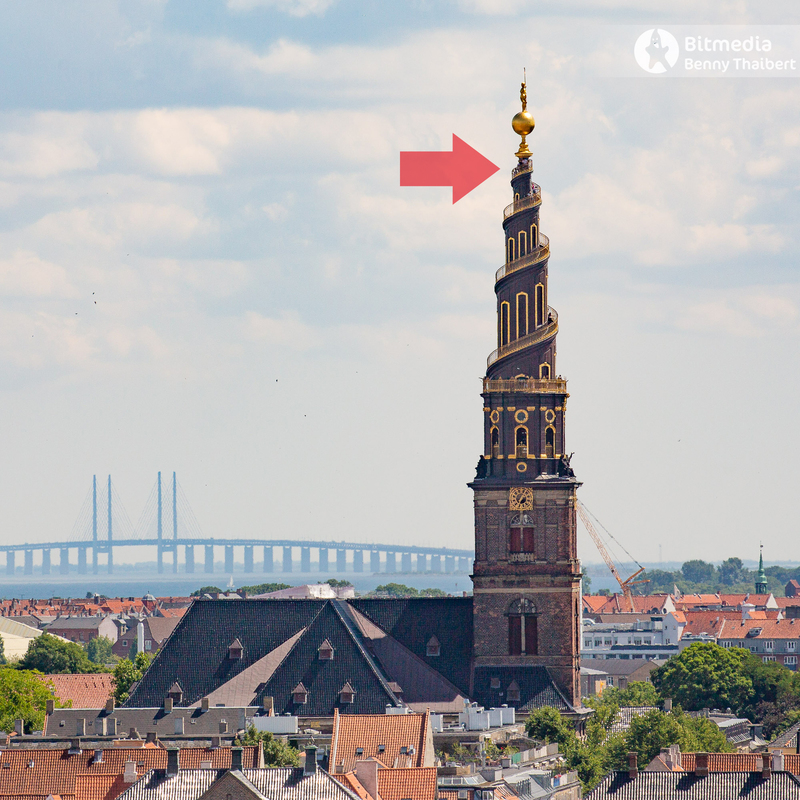 The large bell made in 1828 is the largest church bell in Denmark. 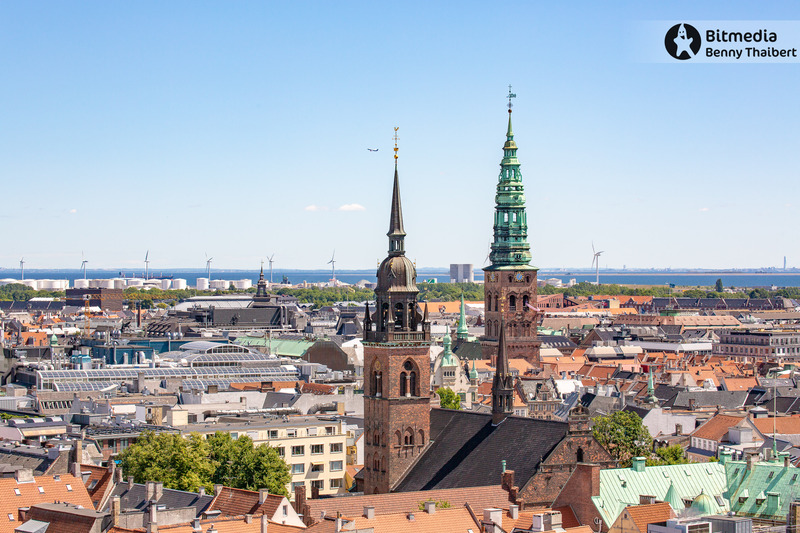 St. Nikolaj Church originated in the early 1200s and is Copenhagen’s third oldest church. 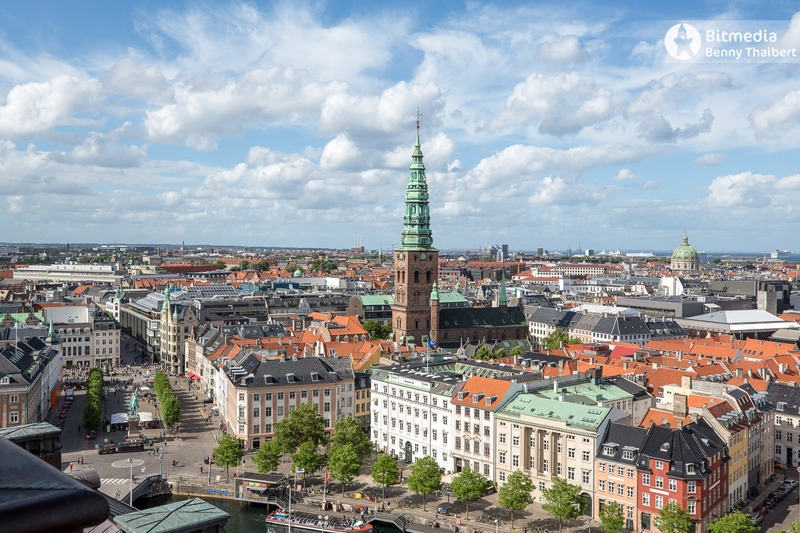 As a consequence of the Great Fire of Copenhagen in 1795, the building’s history as a church came to an end in 1805. Since then it has had numerous different functions including, being a fire station, a naval museum and a public library. In 1981 the building became Copenhagen City Council’s official exhibition space. Getting up: Wooden stairs most of the way. Only the last bit demands some narrow parts.